↑ "2016 National and Local Elections Statistics". ↑ "Highlights of the Philippine Population 2015 Census of Population | Philippine Statistics Authority". psa.gov.ph. สืบค้นเมื่อ 2016-10-31. ↑ "History of Cebu". Cebu City Tour. สืบค้นเมื่อ February 22, 2013. ↑ "Cebu & Philippines - International Eucharistic Congress 2016". สืบค้นเมื่อ 24 June 2016. ↑ "Cebu Archdiocese Philippines - Archdiocese of Cebu Philippines - Ucanews". สืบค้นเมื่อ 24 June 2016. ↑ Aeon (29 December 2014). "'Cradle of Christianity' or 'Seat of Christianity' in the Far East?". สืบค้นเมื่อ 24 June 2016. ↑ "Climatological Normals of the Philippines (1951-1985) (PAGASA 1987)" (PDF). PAGASA. สืบค้นเมื่อ 18 April 2016. ↑ "Statistical Tables on Sample Variables from the results of 2010 Census of Population and Housing - Cebu". ↑ Cebu Daily News, Fernando Fajardo (11 มกราคม 2556). "Has 'Ceboom' returned?". Archived from the original on 13 มกราคม 2556. ↑ 13.0 13.1 Victorina Zosa (August 2004). "Philippine – Japan Economic Linkages: A Case Study of Cebu" (PDF). Discussion Paper Series No. 2004-33. Philippine Institute for Development Studies. สืบค้นเมื่อ 16 March 2017. ↑ "Cebu rises to 8th best site for BPOs". Sun Star Cebu. สืบค้นเมื่อ March 18, 2013. ↑ "Metro Manila, Cebu among top global BPO destinations". Yahoo! Philippines. สืบค้นเมื่อ March 18, 2013. ↑ "Non-voice overtakes voice operation in Cebu". Sun Star Cebu. สืบค้นเมื่อ June 25, 2013. ↑ Department of Tourism Philippines official website page on Cebu. Accessed 28 September 2009. ↑ Cebu Pacific Air (18 กรกฎาคม 2549). "Cebu Pacific adds flights to Cagayan de Oro, Tacloban and Tagbilaran to meet demand". ↑ "Mactan Cebu airport to set aside P300M for expansion". ↑ Mosqueda, M. W. (30 May 2014). "NEDA okays bus rapid transit system for Cebu". Manila Bulletin. สืบค้นเมื่อ 23 September 2015. ↑ "Funding for Cebu Bus Rapid Transit system approved". Rappler. 27 August 2014. สืบค้นเมื่อ 23 September 2015. ↑ Agcaoili, L. (8 June 2015). "DOTC eyes consultant for P10.6-B bus rapid transit system in Cebu". The Philippine Star. สืบค้นเมื่อ 23 September 2015. ↑ "Gov't signs WB loan for Cebu bus rapid transit project". Rappler. 31 October 2014. สืบค้นเมื่อ 23 September 2015. ↑ Montalbo, C. M. (10 April 2015). "The dignity of travel: The Cebu BRT project". สืบค้นเมื่อ 23 September 2014. ↑ "Sister Cities, Public Relations". Guadalajara municipal government. Archived from the original on 2 มีนาคม 2555. สืบค้นเมื่อ 12 มีนาคม 2556. ↑ "Haarlemmermeer Officials sojourn here". City of Cebu. สืบค้นเมื่อ 9 ธันวาคม 2559. ↑ "C7th Multi-city Youth exchange : A Success!". City of Cebu. สืบค้นเมื่อ 9 ธันวาคม 2559. ↑ "Let's not reject old allies". Sun Star Cebu. สืบค้นเมื่อ 10 ธันวาคม 2559. ↑ "Seattle International Sister City: Cebu, Philippines". City of Seattle. Archived from the original on 22 มีนาคม 2557. สืบค้นเมื่อ 7 มิถุนายน 2557. ↑ "Sister cities". Vladivostok city administration (in รัสเซีย). สืบค้นเมื่อ 3 ตุลาคม 2557. ↑ "Rama renews ties with Xiamen City". philstar.com. สืบค้นเมื่อ 12 กรกฎาคม 2557. ↑ "Cebu Yokohama Cities joint survey mission". City of Cebu. สืบค้นเมื่อ 9 ธันวาคม 2559. Cebu Daily News, Doris C. Bongcac & Tweeny M. Malinao (22 มิถุนายน 2555). "Guadalupe plebiscite scheduled on July 28". Cebu Daily News, Jose Santino S. Bunachita (3 มกราคม 2560). "Road right-of-way costs up for BRT". Archived from the original on 27 กุมภาพันธ์ 2560. Foreman, John (1906). The Philippine Islands. A political, geographical, ethnographical, social and commercial history of the Philippine Archipelago and its political dependencies, embracing the whole period of Spanish rule (3rd ed.). New York: Charles Scribner's Sons. Gonzales, Glenda R. (December 2004). 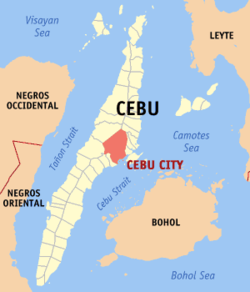 "Metro Cebu: A Metropolitan Area in Need of Coordinative Body" (PDF). DISCUSSION PAPER. 2004-49. PIDS. Archived (PDF) from the original on 10 มีนาคม 2559. สืบค้นเมื่อ 16 กุมภาพันธ์ 2559. Sun Star (16 พฤษภาคม 2550). "A 'megadome' for Cebu City: Councilor Jack". สืบค้นเมื่อ 11 มิถุนายน 2552. Sun Star (1 สิงหาคม 2555). "Wenceslao: Banawa-Englis dream shot down". Archived from the original on 1 สิงหาคม 2555. หน้านี้แก้ไขล่าสุดเมื่อวันที่ 22 มิถุนายน 2561 เวลา 14:21 น.